When I was a kid, there was a razor commercial on TV where some famous guy (I assume he was famous from the context of the commercial, but I have no idea who he was) said that he liked the razor he was touting so much that he'd bought the company. I can't imagine being so passionate about a razor that you had to buy the company, but I reviewed an author that I like so much, that I acquired her latest work for my publishing company, Imaginator Press. Back in April, I reviewed Ratha's Creature, by Clare Bell. Ratha's Creature is an intense young adult book about a young prehistoric female cat named Ratha who is exiled from her clan and must learn to survive. Ratha's Creature was first published in 1983, and won an IRA award, a Pen Center USA award, received a Booklist starred review, and was selected for the Best Books for Young People list. Ratha's Creature, along with the other three books in the Named series, were reprinted with stunning new covers last year by Firebird Books. 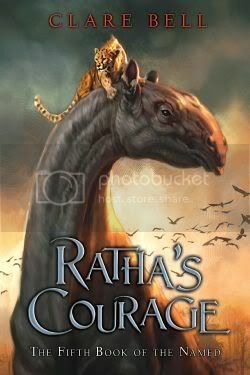 I loved Ratha's Creature and the Named series so much, that when I learned that the newest book in the series, Ratha's Courage, was available, I was excited at the opportunity, and reached an agreement with Clare Bell through her agent, Richard Curtis, to publish it. Many thanks to Spirithunter, a member of the Wands and Worlds teen community, for suggesting the idea. Ratha's Courage will be published next month, and if any bloggers are interested in an ARC, please let me know. Author Clare Bell is also available for interviews. She's a fascinating person, who among other things installed her own solar and wind power systems at her house in Northern California. In researching Ratha's Courage, she built a skull model of Dinaelurus crassus, a miocene period cheetah-like cat, and another one similar to the first, but with an enlarged braincase to allow for greater intelligence, for a fictional species that she named Dinaelurus illumina sapiens. You can see these skull models and read more about the research and preparation for the book on the author's web site, Ratha's Courage.com. I happened upon this blog, but I just wanted to say the cover for this book is beautiful..
and the book itself looks incredible; I think I might go read the series, haha.. many thanks! Thanks, Emily. I think most of us tend to judge a book by its cover; hence the expression! Great last name, by the way! I keep thinking about this book, could I possibly get an ARC? Wow, the author's drawings are incredible; very inspiring! Email me at the email address in the right sidebar and we'll discuss it. Thanks!